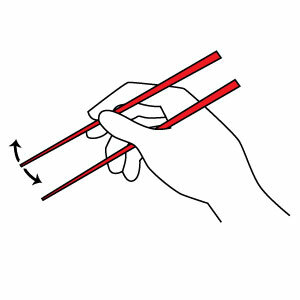 Here's our easy illustrated guide on how to use chopsticks properly in just 3 easy steps. Do you fumble with chopsticks? Feel like an awkward dummy at a Chinese restaurant? Well have no fear. Using chop sticks is easy. Follow our simple and easy steps to eating with chopsticks, try our practice tips, check out our etiquette pointers, and in no time you'll be using them like a pro. Step 1. 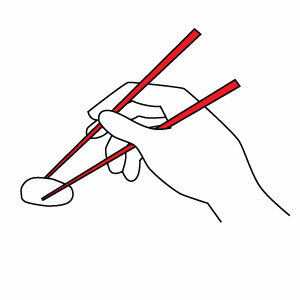 Place the bottom chopstick in the valley between your thumb and index finger, and across the side of the tip of your ring finger, and press with your thumb across the open middle. Step 2. Hold the top chopstick sort of like you would a pencil. Lightly grip the stick between the pad of your thumb and between the tips of your index and middle fingers. Step 3. The first chopstick is stationary. Move the top chop stick, using them like tongs to grip pieces of food. 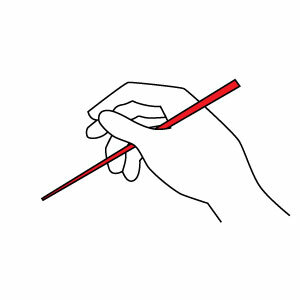 Here are the illustrations reflected to show how to hold chopsticks if you are left handed. Just follow the same instructions as above. 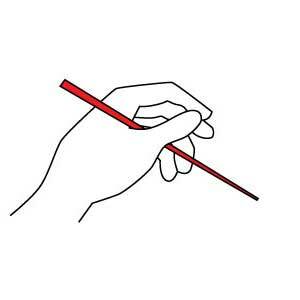 First hold the bottom chopstick between your thumb and ring finger. 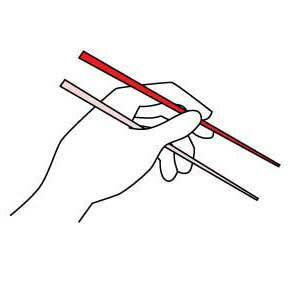 Then hold the top chopstick between your thumb, index and middle fingers. Move the top chopstick only. 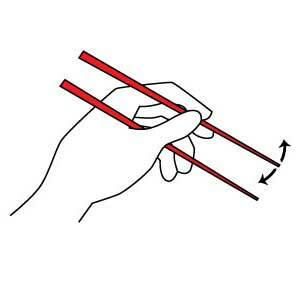 Let's practice using chopsticks when you are picking up food. Start with simple foods such as cubed chicken. Put the chop stick tips on each side of the food piece, move your hand so the stationary (bottom) stick is slightly touching it, and gently close the top stick until you have a sufficient grip to raise the food. Initially it is easy for the chop sticks to twist and cross, dropping the morsel. Practice picking up (and eating!) the easy food pieces. To help with twist and cross, practice on difficult round pieces of food like cherry tomatoes or grapes. In a short time your hand will gain dexterity. Continue on your practice adventures with ramen noodles. By the way, you eat rice by using the chop sticks more as a scoop than a grip. And, in almost all East Asian restaurants and cultures it is normal and acceptable to raise your bowl of rice close to your mouth. Just don't do that in Korea. Here's a few quick pointers on how to use chopsticks with good etiquette. Don't pierce or stab food with your chop sticks. Don't point your sticks at other people. Don't play around with your chop sticks or use them like drumsticks. When you are done eating, place your pair of chopsticks across your plate or dish. Don't rub disposable chop sticks together as that implies they're cheap. Sushi is usually eaten with just your fingers. Tip: Use the chopstick wrapper from your bamboo chopsticks as a rest by folding it up into a small tent. That's it! Now you've learned how to use these wonderful eating utensils, and with a little practice you'll be able to use them like an expert. Have fun at your next dinner and show off your new skills! Japanese vs. Chinese Chopsticks, What's the Difference? And don't forget to think of EverythingChopsticks when you want to find that perfect pair for you or your special someone. Here are some aids and training chopsticks to help you.